Torqeedo has announced a series of new electric propulsion products for the leisure and pleasure segment in 2019, including a more powerful version of its flagship Deep Blue electric motor. Up until now, 50kW was the maximum power available from a single Deep Blue motor, while twin installations delivered up to 100kW. However, in 2019 Torqeedo will launch new Deep Blue 100kW motors, meaning that twin installations will provide up to 200kW in a fully integrated drive system. The motors are available in two versions: a low-rpm version for displacement boats and a high-rpm version for planing boats. 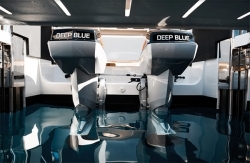 The company will also launch an upgraded, higher-capacity version of its Deep Blue battery. At 40kWh it features more than 30% more capacity in the same footprint as the previous version and an energy density of 144Wh per kg. This 30% increase in energy and energy density will also extend to Torqeedo’s 24V batteries. Based on the new capacity, the 24V battery gets a new name: Power 24-3500, featuring an energy density of 138Wh per kg. Furthermore, the Travel 1103 electric motor, designed for tenders and sailing dinghies, will be added to the company’s range of travel motors. Reportedly the quietest motor in its class due to a gearless direct drive, the Travel 1103 also features optimized throttle characteristics for improved control and enhanced mechanical robustness. Finally, 2019’s Ultralight 403 A electric motor, designed for kayak fishing vessels, features a new mount that makes installation easier and provides more functions for control and transport. 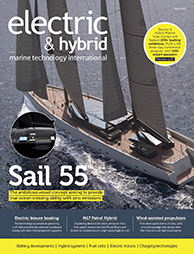 “By delivering more power, more energy, more silence and more convenience, Torqeedo honors its commitment to improve customers’ boating experiences and advance marine electric mobility every year,” said Christoph Ballin, CEO of Torqeedo.